Naturally I would have to say that nothing compares with the hazy woodland swathes of British bluebells; their slender spires gently nodding; the subtle fragrance that not quite like any other scent. By contrast, the garden-escaping Spanish sort are much more upright and chunky, more like a skinny hyacinth. They have blue pollen too, or so the Woodland Trust site tells me. And it also says they are a big MENACE. People hate them in their gardens and so dig them up and dump them round the countryside, where they have relations with our native species, so changing them forever. Without doubt, losing our native species would be a great a shame, but I still have time for the Spanish cousins that pop up around our garden. Admittedly I used to try to dig them up and compost them – until I learned that it was a pretty impossible task to excavate every part of them. Now when they flower, I pick them. They make excellent house flowers, their bells opening wider and the blue fading over the days. They smell nice too. I’m thinking that cutting them off at the roots might also put a stop to fraternisation, and ultimately weaken the plant. In the meantime, I have the pleasure of them indoors. Picking the native species is of course very much forbidden. But those of you who live in the UK will soon have the pleasure of spotting them in a wood near you. Reports have it that they will be flowering early this year. Six Word Saturday Now pop over to Debbie’s for more SWS posts. Posted on April 15, 2017 by Tish Farrell	This entry was posted in Botany, Gardens and tagged bluebells, photography, Six Word Saturday, Tish Farrell Writer. Bookmark the permalink. Lovely post Tish. I hadn’t realised the Spanish invaders were such a menace, but I have to admit I enjoy them all. I can understand that the invaders hybridising with native species is a problem. 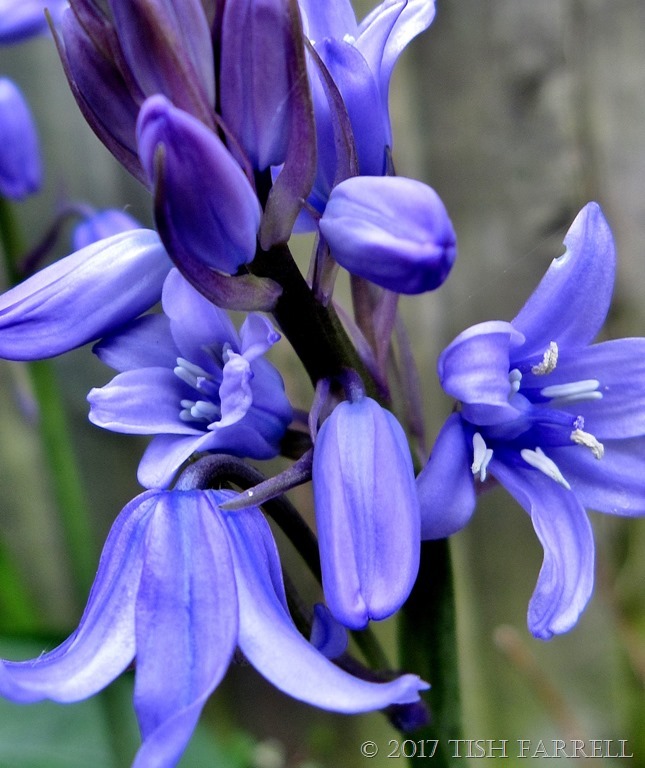 Let’s hope people stop dumping their discarded Spanish bluebell plants in such a way that they can propagate elsewhere, although it sounds as if the horse has already bolted. However, woodlands carpeted with bluebells in flower are a wonderful sight and I hope that you get the opportunity to enjoy them somewhere this season. Thanks, Carol. I’m sure we’ll get some good bluebell views along Wenlock Edge in no time at all. At the moment it’s all primroses and wood anemones – also very lovely. Life moves on. Imagine if we had been able to prevent the Saxons and the Vikings and the Normans etc from Hybridizing with the locals? That’s an interesting thought, Ark. Or even earlier couplings with Neanderthals??? Or even Manchester United supporters. *shudders* and has to go for a quick lie-down. I think I saw some in the lane near me. You can tell the difference as our native flowers only hang from one side. And yes, the Spanish ones do resemble hyacinths. I only have three cornered leeks in my garden, pretty white flowers and edible! You’re right. They’re all beautiful in their own way. Some people are so racist, Tish! 🙂 🙂 I’ve spotted a few and I do think it’ll soon be time to head for the woods. I guess hybridizing is better than annihilating as happens with some invaders. Strange that my first thought is to want to protect natives, but when I think about it in a social (i.e. populations, not species) context, it does seem racist. It’s not straight forward, is it. No. But they’re important things to think about in this troubled world. It’s a fine tangent, Meg. I love the sound of kangaroo apple and fairy fan flowers. Adore your photo , Tish.. I think our intentions of keep only local plants has become pointless. All of New England is swathed in day lilies (from India) and black-eyed susans which are from down south … and who knows what else. Plants have always moved around. Maybe faster, now, but I’m glad the flowers are spreading. You’re right about the way plants have been spread by humanity, and mostly it is a source of pleasure, but some plants can be thugs as well. Just thinking of water hyacinth, spread by gardeners from South America. It is crippling African waterways, and ruining lives in all kinds of ways. It does have some good points though, apart from looking very lovely: its roots can clear toxic waste from water too. I’ be very sad if we lost our natives bluebells, but still think the Spanish ones are pretty. I agree that they’re both pretty, but the woods wouldn’t look the same with upstanding bluebells somehow. I’m sure it won’t happen.